The single best way to attract new readers, and ultimately customers, to your website to is to update it consistently with quality content. My job is to provide this content for my clients – both marketing companies and small businesses. I thought I might share some insider tips that can help you with your content creation. There was a time when all you needed to do was pepper your website with all the relevant keywords for your business, but Google and other search engines have gotten smarter. Now quality content is key for reaching the top spot on any given search term. Your content should always be relevant to your business, educational for the reader, and entertaining. There are two general rules when it comes to blogging: the 80/20 rule and creating “evergreen” content. The 80/20 Rule. Your blog needs to be 80% informative, educational, and entertaining. The remaining 20% of content can be used for self-promotion. Of course you want to promote your new products or events where you will be speaking but these shouldn’t be the only content on your blog. Let me use temporary staffing as an example since it is one that I am most familiar with. A good blog for a temporary staffing company will provide lots of information about job hunting, resume writing, interviewing techniques, and anything else that can help someone find a new job. While the goal is to encourage the readers to contact you to see about placement services don’t be aggressive. Make them want to reach out to you because you are an expert in your field. Evergreen Content. In terms of the Internet “evergreen” means information that will not expire. Continuing to use the example of the temporary staffing company the writer will want to make sure that the resume advice will be just as applicable to someone who stumbles upon the website six months from now as it is to someone reading the day it was published. Even better will be information that is still relevant 3 years from now. Not everything can fall into this category, of course, because events end and promotions end but you can make sure the majority of your content (80%) will be useful for a long time. 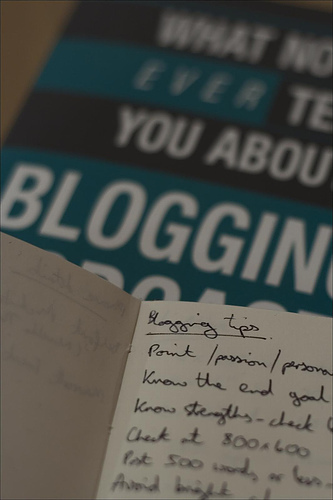 Now that you know what kind of content to provide, how exactly do you craft a blog post? There are Internet etiquette rules and even legal issues that you need to keep in mind. See what I did there? I have taken a short quote from this website to provide an example of how to take quotes from other sources. If you are interested in commenting on another blog, a book, a newspaper article or anything else it is okay to use a short snippet on your blog in this manner. 2. Photos and licensing. Photos are a great way to keep people interested in your blog and to help with visual appeal. However, the rules are pretty strict when it comes to using other people’s work on your blog. Many bloggers have been slapped with lawsuits or have had their websites taken down because they have published photos incorrectly. You can always use you own photos but it is a good idea to create a watermark to protect yourself. Otherwise, you best resource is Creative Commons. This is a license that allows you to use someone’s photograph in your work without permission by providing the right attribution. YouTube works similarly. If a video has the ability to embed you have permission to use it in your blog post. 3. Links. Lots of links in your blog are great for SEO and to help provide additional resources for your readers. However, you want to keep the audience on your blog rather then send them away down a never ending rabbit hole. The best way to do this is to make sure that you set your links to open in a new window or tab. This way when they click on them they don’t leave your site to get to another. Your blogging platform should allow this with one click as you enter the link information. 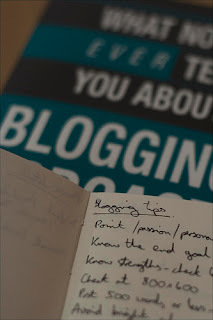 I write blog content both for myself and for my clients. Using these simple tips I am able to create quality content that invites readers back to the site and engages new readers. It is important for a small business blog to attract an audience that will convert to a customer base. If you create evergreen content and provide useful information you can begin to see results. Contact me if you want to know more about content writing for your website. I know this is spam but my favorite part is that it is targeting a blogger about outsourcing the blog. Funny - I do that for other people. If you want a robot or a service to produce your content, you will get the same quality as this spam comment. If you want a professional writer, contact a professional blogger like myself.